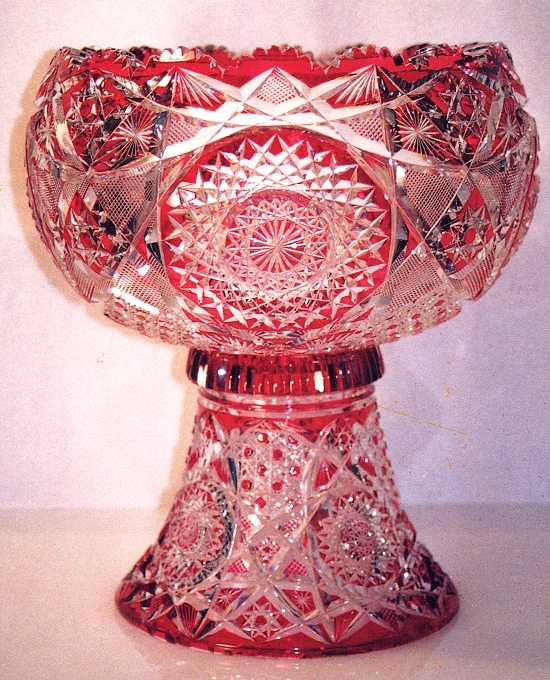 One of the most striking achievements of John S. O’Connor’s company is a red cut-to-clear two-part punch bowl (14″D, 16″H) that the company made at the turn of the twentieth century. The photo is from the dust jacket of the Boggesses’ book REFLECTIONS ON AMERICAN BRILLIANT CUT GLASS (1995). It is also featured in the full-color catalog, “Colorful Cutting” by Gay LeCleire Taylor, that accompanied a special exhibition of American cut glass held at the Museum of American Glass, Wheaton Village, NJ, in 1991. In addition, a black-and-white photograph of the punch bowl accompanies A. C. Revi’s account of John S. O’Connor’s company (Revi 1965, pp. 319-23). Discussion of the punch bowl begins, in this file, at approximately the mid-point of its history — the summer of 1964, when the bowl was exhibited for a week at the Hall of Fame of the Trotter in Goshen, NY, as part of the town’s semi-quintennial celebration. At that time it was owned by Letitia Cusick Connelly who had inherited it from her mother, Mary Elizabeth O’Connor Cusick, one of John S.’s several daughters. An account of her grandfather’s company was published in Views (“The Official Publication of the Orange County [NY] Community of Museums & Galleriea”), Vol. 3, No. 2, p. 5 (summer 1964 issue). The Connelly account, which contains a photograph of the punch bowl, has been mentioned by other writers, but without a reference and, therefore, it has been difficult to find. A different photograph of the punch bowl was published in the 31 Jul 1964 issue of The Times-Herald Record (p. 17), a newspaper published in Middletown, NY, a few miles from Goshen, in a brief review of the exhibit entitled “Reflections of an Age” with text and photos by Constance S. Rosenblum. While the text wins no award for accuracy, the article is of interest because it also contains a group photograph of other articles cut by O’Connor’s company: a basket, cologne bottle, jewel case, glove box, and the decanter in the form of a bowling pin that is shown in close-up in Revi (1965, p. 321). Apparently the punch bowl remained in Mrs. Connelly’s possession until her death in 1985. A few years later, however, items from her collection began appearing in the public arena. The late Harry Kraut, an aggressive dealer-collector, acquired the punch bowl about this time and was its owner when it was displayed at the Museum of American Glass in 1991. Kraut died soon thereafter. Although the present location of the bowl is not known, a pair of dealer-collectors in California provided the Boggesses with the photograph that is shown on the dust jacket of their book. But that was ten years ago. It is worth noting that Connelly wrote: “In addition to the value for posterity of the records that have been preserved relating to the O’Connor factory, Goshen can also be very proud of the fact that the largest collection of [the company’s] glass is in Goshen. . . .” And she concludes her article with the statement: “The size of the collection, and high quality of examples, and the unquestioned authenticity, since it has come down in the family, of the Connelly collection makes it extremely valuable for specialists and art-historians.” Unfortunately, and for unknown reasons, the collection of which Mrs. Connelly was so proud has been dispersed, and the whereabouts of the company’s records is a mystery today. Posterity is the loser in both situations. We can now return to 1964 and sketch the earlier history of the punch bowl. The following speculation differs from Connelly’s account in that the writer believes that a strong case can be made that the bowl was actually cut in O’Connor’s shop in Hawley in 1898 — before the Goshen factory was established — and not in Goshen c1905, the date that is given whenever a date is mentioned. Connelly does not suggest this date. It seems to have originated with the curator of the Museum of American Glass’s exhibition in 1991, to be repeated by the Boggesses and others. Nevertheless, there are two main reasons why Hawley in 1898, and not Goshen in 1905, might a better choice for where and when the punch bowl was cut. First reason: One searches in vain for a reason why John S. O’Connor would decide to give his daughter, Mary Elizabeth, such a valuable gift in 1905. The family’s genealogical record indicates no special occasion at that time. There was, however, Mary Elizabeth’s marriage in 1898. This may well have been the special occasion. Otherwise, why would O’Connor choose to honor one of his daughters over the others with such a valuable gift? (His son, Arthur E., could, of course, fend for himself.) Moreover, Mary Elizabeth married a glass cutter, Thomas P. Cusick. Not just any glass cutter but one who became foreman of the O’Connor cutting shop in Goshen, a position he possibly also held earlier in Hawley, in function if not in name. If cut in Hawley, the punch bowl would undoubtedly have been taken to Goshen when the young Cusick family relocated there in either 1900 or 1902 — recent research suggests the latter date — when O’Connor opened his new cutting shop. Growing up with the punch bowl in Goshen, Connelly could naturally have assumed that it was always there. It should be noted that in focusing on John S. O’Connor, the subject of her article, Connelly completely ignors not only the cut-glass items made in Hawley but she also neglects to mention her uncle, Arthur E. O’Connor, who had taken over the management of the Hawley plant as early as 1893. At this time John S. was described in an interview with a journalist as being “now retured from active participation in the business,” and taking a well-earned rest after a career of 45 years in various aspects of the cut-glass industry. Arthur E. seems to have been in charge of the Goshen shop from the beginning, running it with the help of his brother-in-law, Thomas P. Cusick, with John S. remaining in Hawley (Barbe and Reed 2003, p. 192). Cusick is also not mentioned by Connelly although he was her father. She would have had little glass to exhibit at the semi-quintennial were it not for these men. We are not concerned with telescoping generations, but with a time-span of only seven years. All the more reason for suspecting that telescoping has taken place in the dating of the punch bowl. While one would expect that Mary Cusick would have told her daughter the reason for the punch bowl, sometimes such information is simply not passed along to the younger members in a family. Or, Connelly might have known that the bowl was cut in Hawley but chose to “forget” this fact in her desire to display only “Goshen cut glass” at the Goshen exhibit. Another reason for a Hawley origin involves the pattern on the punch bowl. Here it is sufficient to note that the pattern on the bowl is “Chrysanthemum” (and not “Star”, as Revi indicates). “Chrysanthemum” was in use in 1899 (HIGGINS & SEITER CATALOG NO. 10) and possibly even earlier. If the punch bowl were cut in 1905 one would expect that a more recent pattern — perhaps even a new one — would have been used. In the final analysis, whether the punch bowl was cut in Hawley or in Goshen is of minor importance. The question is pursued here to illustrate how a fact, accepted without question, can be challenged by a new hypothesis formed when additional evidence, sometimes contradictory, is discovered. For good or ill, this seems to be the normal situation one encounters when re-examining many topics in the field of American cut glass. 1. Taken at face value this indicates that John S. O’Connor began his career in cut glass at the age of 17 in 1848. This is also the date of his immigration, according to the 1900 Hawley census. And it is the approximate date when Neil O’Connor is said to have brought his family to NYC, where John S. is believed to have begun his apprendiceship at Turner & Lane’s shop.